In this episode, Tom tackles one of the most challenging situations we all find ourselves in at work. What do you do when you’re having conflict with that JERK at the office? Exactly what to say to that other team member to help you resolve the conflict completely. Tom also introduces Delegation – the 30% Solution – a simple way to hand off to team members and get work done on time and with the right quality level – all while saving you time! If you want to know how/when to confront a disrespectful team member, check out this episode! Case Study – the 30 Percent Solution – This story demonstrates the 30 Percent Solution being put into practice, letting you see how it might unfold when YOU use it. Announcer: [00:00:00] Becoming a Geek Leader, season one, episode nine. [00:00:33] Train your whole team for less than $500. Each lesson is 30 minutes or less, so it fits right into your current team meeting schedule. Find more information and get immediate access to your first free lesson at brighthillgroup.com/helpinggeeks. That’s brighthillgroup.com/helpinggeeks, so that you can get access to the Geek to Great 101 course. [00:01:04] Welcome to the Becoming a Geek Leader podcast. My name is Tom Cooper. As a geek, I’m on a mission to figure out better ways to lead others at work and at home. Through the Becoming a Geek Leader podcast, I’m sharing what I’m learning so I can help make you more effective at leading people, too. Ready? [00:01:25] Hey, thanks for joining me today. I am so excited to talk to you. What I want to talk about today is, how can you resolve conflict in a productive way? I’ve got some practical tips for you on that and I’m really excited about sharing them with you. Also I’ve got a worksheet that you can download from the website. I think it’s going to be a big help to you and I’m looking forward to going over that material. Also I want to introduce you to a better way of delegating work. I call it the 30% Solution. [00:02:00] Also I just want to call out a quick shout-out to another podcast that you might want to check out. For those of you who aren’t theology nerds or followers of church history, you might not realize that we are rapidly coming up on the 500th anniversary of the date that Martin Luther nailed his 95 Theses to the church door at Wittenberg. As it happens, that turned out to cause a major shift in the Christian church and in church history. [00:02:32] For those of you who have any interest in thinking about how things were 500 years ago or about the factors that may have affected Martin Luther’s decisions to go the way he did…and there are good and bad in all the things that he did. Man, that guy had some pretty powerful insults. The guy had a kind of crazy tongue, too…but what you might want to check out is a terrific new podcast called The Life and Times of Martin Luther. I’ve gotten acquainted with the creator of that podcast, Steve Fogle, and his content is great and it’s an entertaining and informative podcast on the life and times of Martin Luther. You can check out more information about his podcast on www.martinlutherpodcast.com. [00:03:24] I know I’m frequently interested in checking out different podcasts and different types of content, and I just wanted to let you know this is one I enjoy and suggest you might want to check it out as well. He recently got picked up in New and Noteworthy and there have been an awful lot of folks who’ve been interested in it. So I hope you enjoy it. [00:03:43] So I’ve got a lot to cover with you today and I’m looking forward to getting started. So let’s jump right in. Tom: [00:04:07] For the Mentoring segment today, I want to talk about something that is one of my most requested areas. How to resolve conflict. This is something that I get feedback from people on all the time. If there’s something they want help with, it’s, “How do I resolve conflict with that guy who is just a jerk?” I like to say, “When you’ve got people, you’ve got problems.” The thing is that most of us haven’t had any guidance about how to resolve conflict since kindergarten, right? We know we’re supposed to be nice and supposed to share and try and work it out, but we really haven’t had a lot of guidance about how to do a great job resolving conflict with others. [00:04:53] But you know what’s interesting? Studies show that people who are more skilled at conflict resolution tend to be happier at work. 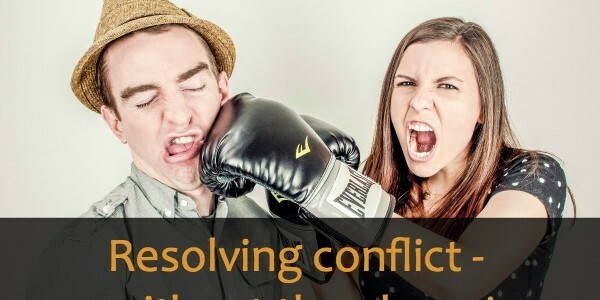 One of the things that my wife and I learned when we were in our premarital counseling is that conflict, when handled properly, conflict can be a gateway to building a better relationship. So in the mentoring segment today, I want to talk about the specifics of, how do you go about having a difficult conversation with somebody? [00:05:21] Now this breaks down into two phases. The first phase is preparation. You’ve got to get ready and then I call it engagement. How do you engage with the other person? Now the fact is that if you prepare before you engage, you’re going to have far better outcomes. In the middle of a dispute, you just are not going to be able to remember a complex process. So what I’m laying out for you today is really simple. [00:05:50] So let’s talk about preparation. The more preparation you have for the conflict, the less likely you are to have it go south on you. The challenge we all face is that conflict is always, always an emotional thing. When you’re dealing with people, conflict is inevitable and it is always going to be emotional at some point. But you cannot let your emotions hijack your brain. [00:06:21] There’s a part of your brain called the amygdala and it is the part that helps you determine how you’re going to respond to things that upset you. When you get into a highly charged emotional situation, your brain lights up and your amygdala helps process those inputs. If your fight or flight response kicks in, if your amygdala says, “Whoa, we’ve got to either fight or get out of here,” your rational thought is gone. You need to get a handle on your emotions before you get into that difficult conversation. [00:06:54] Now it turns out that it’s easier than you might think. Remember I said there are two phases. Phase one is preparation. For the preparation phase, I want to introduce you to an acronym, CORE. I recently attended a workshop with Dr. Les Parrott. He’s a relationship researcher who’s spent decades doing academic studies on conflict resolution. In his workshop, he taught me about the CORE of conflict. Before you have that conversation with the other guy, spend a few minutes thinking about CORE. CORE is an acronym that stands for cooperation, ownership, respect, and empathy. [00:07:38] So C, cooperation. Connectors connect on common ground. How can you cooperate with the person you’re having a conflict with? What is something you can both agree on? What’s a goal you can both buy into? You want to start out with that. You want to find that common goal so you can lead with your intent. You want to have that positive outcome defined for both of you. Your goal is not to win and it’s not to be right. It’s to try and find something where you can both walk away feeling like it’s been valuable, it’s been a win for you. So that’s cooperation. [00:08:16] Now let’s talk about ownership. You have to own your piece of the problem. There’s never a conflict that’s 100% the fault of the other guy. Even if your responsibility is only 1% and the other guy is 99% wrong, you have to own 100% of your 1%. Dr. Parrott says, “Humble pie is a pastry that’s never tasty.” What you want to do is think about your goals cooperation, and you play a part in that. Is there anything that you did that helped contribute to or helped escalate the conflict? You want to have some ownership, you want to recognize your part of the problem. [00:09:07] Now we go from cooperation and ownership, now we’re going to talk about the R, respect. You’ve got to keep the conversation respectful. It’s not personal. It’s not about the character of the other person. It’s not even about their intent. You might think you know their intent, but you probably don’t. So you’ve got to find a way to frame the conversation around their behavior, not about who the person is. And we’ll talk in more detail about that in just a minute. But your goal is to be able to focus on the behavior and focus on the outcome, not focus on their intent or upon their character because you need to be able to show respect. You’re going to focus your attention on specific actions, not your interpretation of those actions. [00:10:06] So we talked about cooperation, ownership, respect. E, empathy. You want to step into the other person’s shoes. Do you think that guy set out to be a jerk? I doubt it. It almost never happens that somebody wakes up and says, “I want to be evil today,” or, “I’m going to make it my goal to really annoy you.” Most of the time, people are so selfish that they don’t think about you very much. I heard Dr. Phil say, “You wouldn’t be so concerned about what other people think about you if you knew how rarely they did.” Get in the other guy’s shoes. Try to understand their perspective. So phase one is CORE, cooperation, ownership, respect, and empathy. [00:10:58] Now let’s turn the corner and talk about phase two, engagement. Now this engagement part is where you need to keep it simple because as I mentioned before, if you start to get into that highly charged emotional situation, it’s going to be very easy for you to let your emotions run away with you and not be able to work your way through it. So we’re going to try to keep it as simple as we possibly can. We’re not going to go with any kind of complex game plan. [00:11:58] Here it is. It’s the XYZ Formula. The XYZ Formula. I told you I was going to keep it simple, right? So XYZ. In situation X, when you did Y, it had Z impact. Let me repeat that. In situation X, when you did Y, it had Z impact. It really is as simple as XYZ. So situation X, when you did Y, it had Z impact. [00:12:30] So let’s walk through an example. You’re in a meeting. The boss asks for your suggestions and one of your peers is sitting there, he’s looking at his phone. While you’re talking he looks up at you and then he starts making faces, disapproving faces. Eventually he folds his arms and he rolls his eyes and he sighs. Then he looks away. Can you imagine any more disrespectful situation than this? Finally he picks up his phone and he just fiddles with his phone for the rest of the meeting. [00:13:03] Now worse than being disrespected in public is your boss seems to be kind of following cues from this team member and your boss’s reaction to your great idea, it’s lukewarm at best. Now the thing that’s super-frustrating is that this is a good idea. You know it’s going to work. It represents some of your best thinking on the problem. And in fact, just the other day you mentioned it to this disrespectful team member and he responded positively. Why in the world would this guy do something like that? You feel like he yanked the rug out from under you and you are so angry that he was disrespectful and even contemptuous towards you. Why was he being such a jerk? [00:13:49] Now this is one of those moments where your amygdala can hijack you right into fight or flight. But rather than decide to respond in the moment, you choose to take the two phase approach that I just discussed. So you get some distance physically and time-wise from the experience and you start thinking about the CORE. So cooperation. What could you do, what could your goal be, how could you cooperate, how could you both agree on a direction that you need to go? Well, what if your goal was you want to have a good working relationship with your peer and you want to work through this conflict? That can be your cooperation. It’s as simple as that. It doesn’t have to be complex. [00:14:37] Now let’s talk about ownership. Now this one is a little unclear. You really don’t know what was happening with that team member other than what you observed. What part did you play in this conflict? One possibility is that your interpretation of what you saw affected what you perceived and how you responded. Maybe you were seeing something that wasn’t there. Maybe there was more to it than that. And again this may be your part of the problem, is just your reaction to what happened. [00:15:14] Now we go from cooperation and ownership to respect. Now your reaction was he was being a jerk and I’ve got to tell you, if I was in that situation…and I have been…it has definitely been tempting to think, “Man, that guy’s a jerk.” But you don’t want to name-call. So how can you deal with it? Well, what was it that he did exactly that was upsetting? [00:15:40] Well, it really was the body language, wasn’t it? It was the eye-roll, the folded arms. How can you in your communication, rather than conclude you were being rude or you were being disrespectful or you were being a jerk, how can you focus respectfully on the behavior of the other person rather than the intrinsic nature, rather than his character or who he is, his essence as a person? Focusing on the behavior rather than your conclusions about the behavior. [00:16:08] So cooperation, ownership, respect. Now let’s talk empathy. What was going on with that person? Is it possible that you don’t actually know? I would suggest that there’s a strong likelihood that you don’t actually know. Maybe he was physically in the room but he wasn’t actually listening to you at all. All right, so we’ve walked our way through identifying CORE, the cooperation, ownership, respect, and empathy. You’ve had some time to think about it and you’ve got the CORE nailed down. Now let’s talk about engagement. [00:16:46] First pick a time that’s going to be good for both of you. Don’t do it in public. Don’t do it on a short deadline, “Hey, we’ve got two minutes before the meeting. Let me try and work this out with you.” Make sure there’s time for you to talk. Now it doesn’t have to be an hour. Set up 15 minutes on a person’s calendar or grab a cup of coffee or go to lunch. Do it in a way that can be private to just the two of you in a spot where you’re comfortable and can have good interaction. That’s going to set you up for more success. If either one of you is feeling time-crunched or in an awkward place or time, it just isn’t going to work. It doesn’t have to be a big deal. This can be over very quickly and very efficiently. [00:17:27] So think XYZ. In situation X, when you did Y, it had Z impact. So what was the situation? It was during the team meeting. Not, “You always,” or, “You have a tendency to,” or, “People say you,” no. In this specific situation, it was during the team meeting when the boss asked for my ideas about the project. So that’s situation X. You did Y. You rolled your eyes, you folded your arms, you sighed, you looked away. It had Z impact. I felt like our boss rejected my idea because of your reaction, at least in part. I didn’t like it. I didn’t like the way it felt. [00:18:57] Now you’re not attacking him, you’re not criticizing him, you’re saying, “You did this thing and it had this impact. What was going on?” And notice that you’re asking, “Can you help me understand what happened?” Now one possibility is that he will say, “Yeah, that was a stupid idea and the boss should have hated it.” I’ve actually worked with some engineers who would say that, but I’ll tell you that that’s actually pretty unlikely. [00:19:24] The more likely outcome is that you’re going to have a different conversation altogether. In fact, he might say something like, “I don’t know what you mean. I didn’t mean that towards you. I’m sorry if it came across that way.” Now that might actually be the best you ever get. That might be the best you ever get and you have to be willing to accept it. Even if they say something like, “I’m sorry if I hurt your feelings,” or, “I’m sorry if I upset you.” Obviously you’re upset. But remember a lot of people haven’t had any guidance about conflict resolution since kindergarten and it’s very difficult for all of us to admit when we’re wrong. [00:20:43] Here’s my point. You really don’t know what was going on inside the other person’s head. Even if you think you do, even if you’ve worked with him a long time, even if you think, “Oh, yeah. I know exactly how that guy is,” you really, really don’t know. All you saw was what happened on the outside and your reaction to what happened on the outside. [00:21:03] So to wrap up, I want you to think CORE, cooperation, ownership of my part of the problem, respectful, and empathy. And then the XYZ Formula. In situation X, you did Y, and it had Z impact. That’s the core about how to have a difficult conversation. 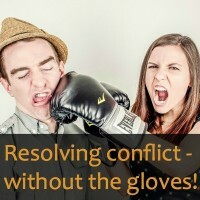 [00:21:22] Now I’ve got a worksheet that’s on the website for this podcast episode and I would encourage you to download that worksheet to help you think through some of these ideas as you go through resolving a conflict. I’m telling you, if you take this approach you will be astonished at how powerful it is. You’ll be amazed at just what an impact it makes on your ability to resolve conflict and really improve your working relationship with your coworkers. That’s today’s mentoring segment. [00:23:03] Man, Rashid, I can relate to that. It is really frustrating to feel like you’re the only one who gets it and the only one who can get it right. What’s worse is, if you’re like most of us, you’ve made your career so far on your ability personally to deliver great work. So the easiest thing is just to do it yourself. But unfortunately as you’ve noticed, that doesn’t really work. It works because you deliver the specific things that you need to get done, but it doesn’t work because you aren’t able to do every single thing that needs to be done. [00:23:42] Well, I want to share an idea with you that I think is really going to help. I call it Delegation, the 30% Solution. This is a paper that I presented at PMI’s Global Congress North America this year, and it was well-received by the attendees and I think you’ll find that it’s a helpful, easy way to reduce the amount of time you spend working on rework and at the same time, it will help you train your team members to be able to focus on the right things and do the work that needs to be done. [00:24:17] In today’s model, you invest some time handing a project off to one of your team members and they bring it back to you when they think it’s done. But as you look at it, they’ve made some progress, but you were hoping not to have to do any of the work because you were trying to delegate it, right? [00:25:45] Well, I’ve seen that happen. It’s certainly happened to me and I’ve seen it happen with my clients as well. So what I want to do is help you figure out how you don’t end up doing 70 to 80% of the work on the project. Because that’s what happens. You get this work delivered to you, it’s not really good enough, and you have to go back and scramble to get it done because of course they deliver it to you on the deadline. Or close to the deadline. And it wasn’t on your list to have to scramble through and try and get it all done at the last minute, but now it’s dumped in your lap. And that is stressful, right? [00:26:19] So in the 30% Solution, we’re going to take a slightly different approach. For the first phase of the project, you’re going to spend time working one-on-one with them. Once they’ve gotten off to a good start, in phase two, they run with the ball. You’re available to answer questions, but they’re handling it. They own it. Then when they’re almost done, you get to phase three and they’re going to bring the project back to you and you will finish the work together. [00:26:48] So these three phases are the 30% Solution. Phase one, the first 20% of the project you spend working directly with them. Now what’s the advantage of this? Well, you’re going to help them understand the goal. You’re going to help them develop the approach to solving the problem or achieving the goal. And then you’re going to identify for them the resources they need to help them move forward. At the end of that first 20%, at the end of that phase one, you’re going to start phase two. [00:27:22] Now for phase two, they’ve got the goal. They’ve got the approach, they know about the resources, and you feel like they’re pointed in the right direction. So they run with the ball in phase two and they carry most of the weight of the project. They do 70% of the work on their own. Now again you’re available to answer questions, but you’re not making the decisions, you’re not driving the bus. You’re there to support them as they drive the bus. Then as you get close to being 90% of the way through the project, when you get to that last 10%, that’s phase three. [00:27:58] Phase three is you finish the work together. Now that doesn’t mean that when they get to 90% of the way done, they throw it over the fence and then you have to clean up their mess. Wrong. That is not it at all. In fact, it’s the working together at the very beginning of the project and the very end of the project that makes such a huge difference. So you’re going to finish together. That means you’re going to sit down with them, you’re going to go over their reports and their deliverables, and you’re going to help them wordsmith or clean up or finalize the work and get it to that level. [00:28:33] What happens in this process is you’re getting the quality to where it needs to be and you’re giving them direct and specific guidance about how to improve their delivery so that next time, you don’t have to work so hard on that. If you want them to be able to do it, you’re going to have to train them. The 30% Solution provides a good way for you to give them that training without sending them to a class. It also helps you to really understand where the gaps are in their understanding. [00:29:05] So is it worth it? Well, you go from doing 70% of the work to doing 30%. Now of course you’d like to do 0% of the work, right? But this approach is going to reduce your workload and help train your team members. And they’re going to be better equipped for the next project to take even more off your plate. The more you use this approach, the smaller that number gets. It starts out at 30% and it moves down from there. So you do the first 20% together, then they do the next 70%, and then you do the last 10% together. That 20% plus 10%, that’s the 30% Solution for Delegation. I hope that helps as you’re handing off more work to your team members, Rashid. [00:29:50] By the way, do you have a question for me? Feel free to send it to me at coach@brighthillgroup.com. That’s today’s Coaching segment. Tom: [00:30:23] In today’s episode, we covered two important topics. The first was how to manage conflicts with a team member and the second was how to delegate work to other folks on your team. In the conflict section, we talked about the core of conflict and the XYZ Formula. In the delegation section, we talked about training your team, equipping them to take on more work using the 30% Solution. [00:30:50] For today’s hack, I want you to think about a team member with whom you’ve had a recent conflict. How could you use the XYZ Formula to discuss that issue with them? Think about the situation, exactly what they did, and exactly what the impact was, and then make time to go talk it out with them. Now as I mentioned before, there is a worksheet on the podcast page for this episode that you can download to help you get your thoughts in order before you go meet with them. Download that and then go have that conversation. I’ll be excited to hear how it works out for you. And that’s today’s Episode Hack. [00:31:26] Thanks for listening to this episode of Becoming a Geek Leader. You can play a part in helping the podcast to grow. If you enjoyed it, please do me a favor. The way to get the podcast to grow is for you to go to iTunes and give it a rating. If enough of you give me a good rating in iTunes, this podcast will show up in their New and Noteworthy section. Being in New and Noteworthy is a great way to attract more listeners and having more listeners helps me have the support to keep the podcast going. [00:31:52] There are three simple steps to giving me a rating. One, go to the iTunes Store in the Podcasts section. Two, search for Becoming a Geek Leader, and three, give the podcast a great rating. And while you’re there, why not write a quick review as well? Thanks! [00:32:12] This is Tom Cooper. Thanks for listening. Be sure to join me next time for another episode of Becoming a Geek Leader. Join me in my mission of discovering better ways to lead others at work and at home.